Confession time: I've never used shaving foam. I've always been one of those lazy girls who buys the razor with built-in soap so I don't need to apply it separately. On the other hand, Rich always uses plain old soap to shave his face and I'm forever telling him off for it. So when we saw D'Fluff in Lush, I badgered him until he bought it (it may have had a lot more to do with the name than the actual product). In the interests of science, it seemed only fair that I try it out too... On my legs and underarms, not my face! Turns out, it's actually amazing and I am totally converted now! The consistency is creamy but also quite lumpy. Think clotted cream, but bubblegum pink. Despite the gloopy texture, it spreads smoothly and evenly on to the skin, forming a fine lather. I shaved over the top of the cream as I usually do, and I instantly got a really close shave. It hugely cut down the shaving time. There were no nicks, no scrapes- Just a smooth, close shave. 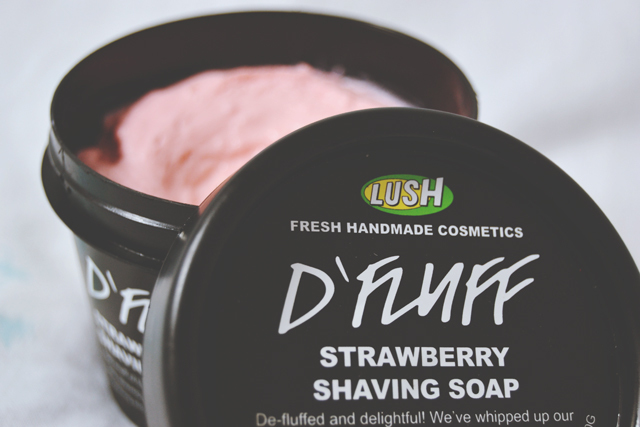 D'Fluff also smells amazing. It's made from strawberries, so it has that fruity scent, but also a floral hint, which is probably from the rosehip oil. Cocoa butter is also included to moisturise the skin as you shave. Afterwards, I was left with ridiculously smooth, soft skin. 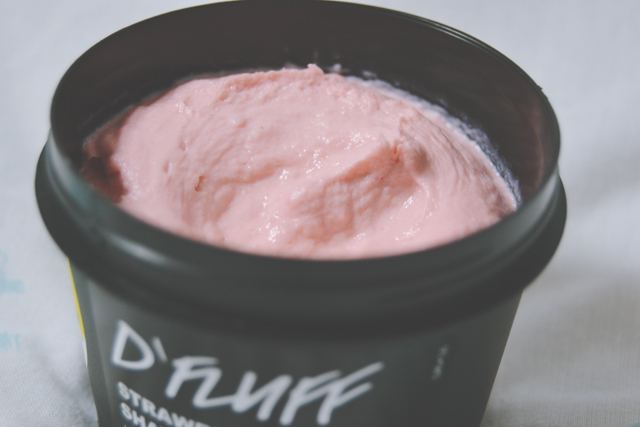 I am so, so happy to have discovered D'Fluff and I can definitely see myself purchasing it over and over again! Sorry, Rich, you're going to have to share! I will admit I never use shaving cream either. To be honest I'm very lazy with shaving my legs, it's one of my most hated rituals. Love the name! The colour reminds me of yoghurt...? I am so keen to try this. I'm far too naughty and lazy with my shaving routine! Never used shaming Cream but this looks amazing, would love to buy some if only my closest store wasn't an hours drive away. I really need to try this - I've seen lots of good reviews about it! I'm a really lazy shaver... Most of the time I use conditioner and, even worse, at times I'll just use shower gel.